One of the great treats we have as grandparents is to have grandchildren stay overnight at our house while the parents get a “break”. 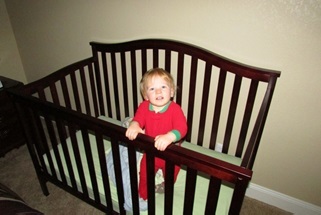 We have a crib set up in a spare room for such a purpose. Recently, we listened on the baby monitor for Elijah to wake up in the morning. Ginger and I sat in excited anticipation—we love to see the world through the eyes of grandchildren. The little noises started. He was talking to himself in the darkened room; probably wondering in the new surroundings where the heck he was and who put him there. I opened the door slowly and he jumped to his feet with that adoring smile; he was ready to be rescued and to greet a new day. For a moment in his awakening, I was also awakened to how dependent these little ones are. They are put in a crib at night with total hope that someone will rescue them in the morning. They HOPE that someone will change their diapers and bath them; feed and clothe them—-to love them. In most of the animal world, the new borns are pretty much fending for themselves in a few days; although they also are blessed with loving parents (especially mothers) who nurture and train them. Still, they become pretty “independent” quickly. For a child, it takes years and years. I am humbled by the fact that we are allowed to witness the unmatched love of mothers, the dedication of parents toward their children, and the love the children show in return as they become a family together. In life as a whole, we would do well to take a lesson from a child’s dependence and become less independent. We ought to be more willing to accept the offerings of others and not be so head-strong. Often we say “I don’t need any help” or “I can handle this”, or the classic teenager lines “It’s MY life”….. And you fill in the blanks. In reality, we could all use a hug when we wake up in the morning, someone to take care of us for a while, we DO often need help, and we all need the warmth of family. We could humble ourselves to accept the outreach of others and to reach out to others. Whether we admit it or not, we are dependent on these things. That’s my view, as I am taught yet another lesson by an awaiting grandson in the morning hours. I recently took the opportunity with my wife and friends to visit the original J. Paul Getty Museum in California. What a wonderful gift he created in his charitable efforts. At one time he was the richest man in America, and he gave much of his fortune to collecting and preserving antiquities and art. I was really impressed with the facilities situated on sixty four acres across the street from the Pacific ocean. But when it came time to connect with ancient Greece and behold all of the statues of antiquity as a docent told imagined stories of their life, my simple mind wandered off to other things. I would find it a hoot to dress up as a docent and tell my own made up stories of antiquity—-but I digress. I found myself texting my children pictures of awe-inspiring statues and making a little fun of them; making up my own stories of antiquity, which was very entertaining to this ADHD mind. This chick was an eye catcher. At least she had a nose and one eye that wasn’t glazed over! I apologize to those who find deep meaning in these things; and I appreciate your passions if this is the case. Having said that; as I was texting my personal epiphanies to my children; my daughter texted me back with pictures of taking my grandson Elijah on his first hike. I was really fascinated by the process of discovery. Note the glory of a rock and the curiosity of the child. Note his ah-hah moment as he discovers stones are meant to be thrown in the creek. And then of course one must retrieve the stone……discovery can have anxious moments. I mused at this sequence as I looked at carved stones of antiquity with missing noses and other important parts. Life is really all about discovery; and we all find our own passions in finding what we seek. Museums are meant to educate and preserve history—a great form of discovery. Life itself is a discovery as I witnessed in the pictures of Elijah’s first hike. While there is much to learn of history, I prefer “living” discovery and have a passion and appreciation for this. One of the most important aspects of life is DISCOVERY; constantly learning and observing as we both live current history or observe the history of others. I observed this dude and texted to one of my sons that he was missing something important. He texted back and corrected me. He didn’t lose anything he said, he was just holding that which was apparently lost. Enjoy your own interpretations as you enjoy life’s discoveries.